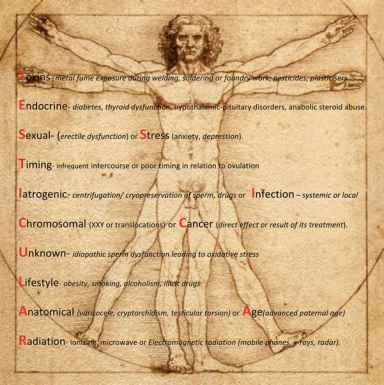 Testes are considered to be an immunoprivileged organ due to their tolerance of autoantigens secreted during sexual maturity by reproductive cells. This phenomenon supports spermatogenesis [6 ] . The mechanisms which protect testes against autoimmune diseases are immunological/anatomical blood-testis barrier (BTB) which protects against the antigenic leakage out of germ cells to immunological, intraparenchymal cells and against the transition of antibodies from endothelium to the lumen of seminiferous tubules; secretion of immunosuppressive factors by macrophages, the Sertoli, Leydig, and peritubular cells; and a limited presence of activated T lymphocytes (particularly that of CD8+) and the presence of regulatory T lymphocytes. Maintenance of the balance between inflammation and "immunoprivileged" gonad belongs, among other, to the function of cytokines which perform both the roles as proinflammatory mediators and immunosuppressive ones . BTB consists of vascular endothelium, basal lamina of seminiferous tubules, and specialized tight junctions (TJs) between Sertoli cells. BTB creates microenvironment in which spermatogenesis takes place: meiosis, spermiogenesis, and sperm-iation. BTB ensures polarization of Sertoli cells and regulates intercellular transfer of water, ions, feeding substances, and biomolecules to germ cells from circulation. BTB regulation is ensured by activated TGFb and tumor necrosis factor (TNF)-a, mitogen-activated protein kinase (MAPK), and c-Jun N-terminal kinase signaling pathways [8-11]. Ectoplasmic specialization (ES) is a junction located in two testicular areas: among postmeiotic spermatids and Sertoli cells of seminiferous tubules—apical ES is involved in migration of preleptotenic spermatocytes in stage VIII of seminiferous epithelium through BTB itself and between BTB and Sertoli cells—basal ES  functions with tightjunctions, desmosomes, and gapjunctions that are components of BTB [12-14]. Cytokines do not only play a role at directing germ cells to apoptosis, but TNF-a, TGF-P2, and TGF-P3 together with testosterone regulate spermatogenesis [9, 15]. Cytokines may influence apical ES as well as the whole BTB through altering protein levels present in biological membranes as N-cadherin in the case of apical ES and occludin in BTB. In consequence of their action is an increase in protein endocytosis and intracellular endosome-mediated degradation . 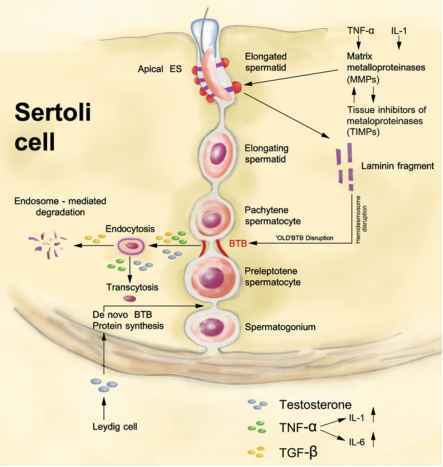 In opposition to cytokine action testosterone increases BTB integrity and enhances protein production as elements of Sertoli cells tight junctions essential for functioning and barrier stability [19, 20] (Fig. 9.1). Coordination of restructuring of apical ES and BTB during spermatogenesis takes place at participation of apical ES-BTB-hemidesmosome functional axis. Reaction cascade begins before spermiation through action of metalloproteinase-2 which cleaves complex integrin-laminin releasing fragments of active laminin that may cause cytokine synthesis, influence endocytosis kinetics, recycling, transcyto-sis, or protein degeneration. It is suggested that metalloproteinase-2 influences the induction of BTB restructuring by TNF mediation. TNF also acts on production of metalloproteinase-9 in Sertoli cells which alters functioning of tight BTB junctions through cleavage of collagen [22-24].